Dr. Simone Brosig received her PhD from the medieval institute at Notre Dame and now serves as Director of Liturgy for the Diocese of Calgary, Alberta. 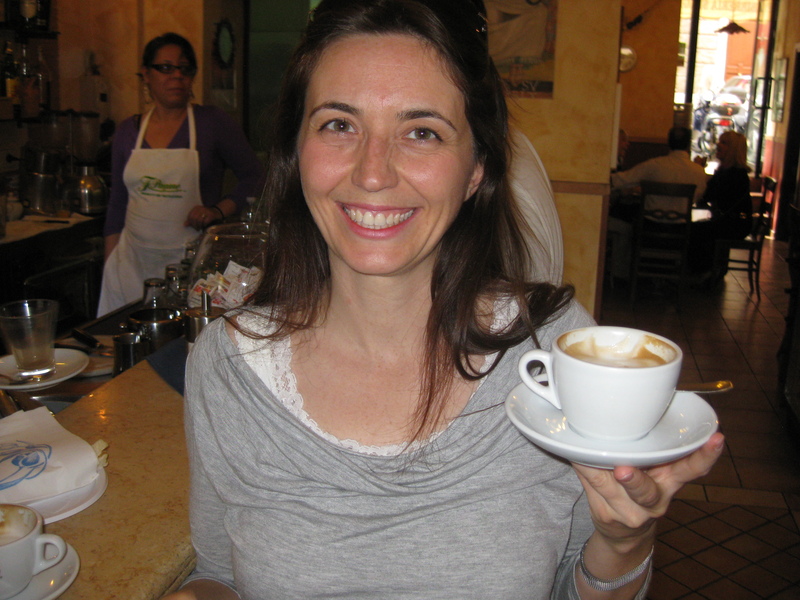 As blessed as I was to have almost two weeks to reconnect with a good friend, I think I can safely say she was a blessing to the whole Lay Centre community while she was with us – and certainly our Oasis in the City provided her a welcome refuge from the chaos of Rome. Over the next 12 days I made sure we visited all the familiar sites in the historic center: the four major basilicas, the fori imperiali, the pantheon, piazza navona, trevi fountain, the Gregorian and the Angelicum, and others. 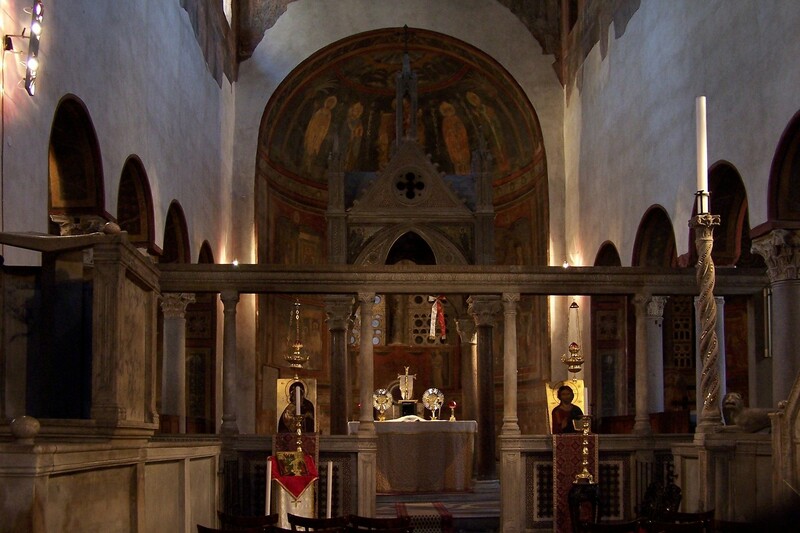 Given her Byzantine interests, we made a point to spend time in Santa Maria in Domnica, Santa Maria in Trastevere, San Clemente and Santa Praessede. We also managed a decent amount of gelato and genuine Roman pizza dinner on the Via della Pace, a classic Roman outdoor street scene if ever there was one. Among a few new places for me were a day trip to Ostia Antica, a sizeable town in ruins that was the ancient seaport and military outpost for the Roman Republic and later Empire. We visited the Musei Borghese within the vast Villa Borghese at the north end of Rome – an elaborate estate once home to Scipione Borghese, the cardinal nephew of Pius V who precisely embodies the ecclesiastical nepotism of the period. (The word for nephew in Italian is in fact, nepote). We also spent a day in Trastevere, discovering parts of the neighborhood I had not before, including Santa Cecelia and the little church home of the Heralds of the Gospel in Rome, San Benedetto in Piscinula, which houses a cell said to have been occupied by St. Benedict of Norcia when he came to Rome. On a Sunday after introducing Simone to one of the best gellateria in Rome, the Gelateria del Teatro, we sat on the steps of a nearby church to eat the creative indulgence. San Salvatore in Lauro, as it turns out, was just about to celebrate the Eucharist with the auxiliary bishop responsible for the centro storico, Most Rev. Ernesto Mandara, presiding. It was one of the most authentically, local Roman liturgies I have been to, and concluded with the opportunity to be blessed with a second-class relic of Padre Pio (his habit). Not something I would have sought out, but truly Italian! Also thanks to her visit I discovered that there are guided tours of the Vatican Gardens (which I will have to try), plenty of places to go dress and shoe shopping in Rome (which I will not be trying), and that one of her former professors is given a stately burial in the crypt of San Clemente, under the 4th century basilica. The highlight of Simone’s visit was herself, of course, but a close second was Divine Liturgy on the 10th with the Melkite Catholics at Santa Maria in Cosmedin. Celebrating the Eucharist in Arabic, Greek, and Italian the small community follows the Liturgy of St. John Chrysostom like most of the Byzantine rite churches, but somewhat simplified compared to the Slavic iterations. With the Synod of Bishops for the Middle East, the following week would see the Patriarch and most of the bishops worshiping with the small community – ‘unfortunately’ I was to be at the canonizations at St. Peter’s instead. By A.J. Boyd in La vita Roma on October 1, 2010 .